President Larry Roberts called the meeting to order at 6:40 p.m. Directors present for the meeting were Doug Alred, Jane Alred, Bonnie Brooks, Colleen Clarson, Errol Daniels, Michael DelCharco, Susan Haag, Angela Harris, Stan Lambert, Franz Lerch, Ty Payne, Larry Roberts, Connie Smith, Larry Sassa, Lamar Strother, Douglas Tillett, Stuart Toomey, and Jim Van Cleave. Director Todd O’Donnell was absent. JTCR members Kay Jones, Bill Dunn, Paul Smith, and Mark Ryan attended part of all of the meeting. Additionally, Colin Moore and Brian Burket from the City of Jacksonville attended to make a presentation to the board. Jacksonville Masters Trails Plan Presentation: Special guests Colin Moore and Brian Burket presented the Jacksonville Masters Trails Plan regarding the improvement and implementation of Jacksonville’s trail system. Approval of 8/1/17 (August meeting) minutes: On a motion by Susan Haag and seconded by Franz Lerch, the August board meeting minutes were approved as submitted. Treasurer’s Report: Treasurer Bonnie Brooks distributed copies of the Balance Sheet and the Profit and Loss Detail through August of 2017 and then explained all the line items. Bonnie reiterated that the end of our fiscal year was August 31st. She also mentioned that Sulzbacher had been paid, but would be covered in more detail during the Finance committee report. JU Running Lab Proposal – Larry Roberts noted that we have sent the signed contract to JU but we have not received a response and the money has not been spent yet. Larry also reported that as part of our agreement and partnership with the JU Running Lab, we can utilize the JU track and set a schedule to have it open members. As a condition of our use of the track, we would need a JTC club member to facilitate the use of the track, as in days and times. Preferably would we like for a board member to serve as the “coach” to organize and conduct these workouts. If we cannot schedule a time that is favorable for a board member, then we can ask club members for a volunteer. The minimum group size to open the track for our use would be 15 members. As of this moment, we do not have an exact day or time, which this would be heavily determined by the coach. Fall Half Marathon Training Class – Our fall half marathon training class will kick off on Thursday, Sept 7 at 6:30pm at the Town Center 1st Place Sports store. Once again, Coach DeSantis will be coaching, leading, and facilitating the class as members prepare for the upcoming fall half marathons. Currently we have 66 runners signed up for the class, which 25 are new club members. Sulzbacher Night, Nov. 11 – Michael DelCharco reported that our next Sulzbacher Night will be Saturday November 11. Again, the night will be split up into two sections consisting of cooking and preparing the meal and then serving the meal. We will need several volunteers to cook and prepare the meal during 3-5pm, then additional volunteers to serve the meal during 5-7pm. Registration and information is currently located on our website. 2018 Track Series – We have already starting discussions for the upcoming year’s track series. At the moment it has been proposed to schedule 7 meets. The dates with Bolles and options for other westside locations, like Bishop Snyder, have been discussed and proposed. Run, Jump, Throw – Angela Harris reported that she is in the works to schedule more events and at more locations for the upcoming year. This past year’s events were such a huge success with the students as well as the JTC members that volunteered. Tijuana Flats Summer Beach Run (Sat 8/26/17) – Doug Alred reported that this event went well. Again, this event was a financial success and generated a great turnout. Guana Trail Races (12/3/17) – Mark Ryan, race director, was on hand to discuss the specifics surrounding this year’s event. The race will be the first Sunday in December. Participates in the races will receive a finishers hat, medal, and be able to attend the after party. The 50K will start at 8am, while the 12K will start at 1pm, and both events will have a cap at 125 runners. Last Gasp (Sat 12/30/17) – Finalizing the race date since other popular races in the same timeframe of December 30-31. Winter Beach Run (Sun 1/21/18) – Doug Alred reported that we currently set with the city and look forward to another great event. JTCR RACING TEAM – Larry reported that Kathy Murray is doing a fantastic job with organizing the team and making sure they are visible and well represented at races. The team continues to have strong performances, which is showcased with their results from Summer Beach Run and Labor Day 5K. 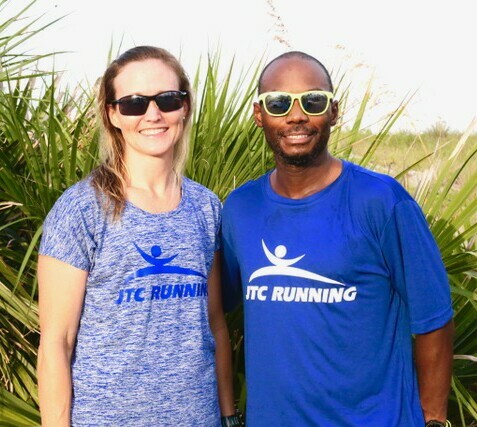 CLASSES & CLINICS – Jane Alred reported that Dr. Jim Presley, from the Mayo Clinic, will start doing a monthly clinic and series for 1st Place Sports and JTC Running in hopes of answering and discussing health and fitness concerns. COMMUNITY & PUBLIC RELATIONS – Larry Sassa reported that the Jacksonville Beach City Manager said no to the water fountain project, however thinks there is still a possibility of at least getting a plaque. The water foundation project was turned down based on the thought that the city would be responsible for the costs in terms of maintenance and vandalism. This project has yet to be scrapped, but we will need to think of other ways to get it off the ground. FINANCE – Bonnie presented copies of the proposed club’s budget for 2018. The proposal detailed the club’s Budgeted Vs. Actual Finances for 2017 and then showed the committee’s proposed budget for 2018. On a motion by Bonnie and 2nd by Doug Tillett, the proposed 2018 JTC Running budget was approved by a vote of the board. MEMBERSHIP – Stuart Toomey reported membership is at 1,208 active members. MERCHANDISE – Connie Smith said that we still have merchandise including hats, visors, and shorts for sale, in addition to the items that were available during the Tijuana Flats Summer Beach Run Kickoff event. NEWSLETTER – Current issue has been printed and is currently in the mail. The newsletter is accessible via the email blast that has been sent out. Deadline to make the next monthly issue is September 10th, but arrangements can be made to wait until the 15th if someone would like to write a story or send in pictures. SOCIAL MEDIA – No Report. SOCIAL & BANQUET – The JTCR Winter Party will coincide with the Festival of Lights 5K on December 9th at the 1st Place Sports San Marco store. NEXT MEETING – The next board meeting will be Tuesday, October 3, at 6:30 pm in the Mediterrania Restaurant. The August meeting was adjourned at 8:13 pm.